Today I headed out to Lincoln for my annual visit to the Audubon Shop at Drumlin Farm. 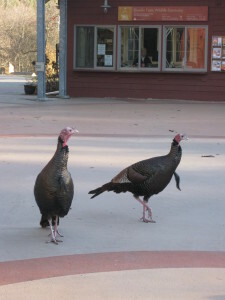 These two big turkeys were right outside. There was actually a third turkey sitting among the trees behind us. Nothing’s better than being a turkey strutting about the day after Thanksgiving. And nothing’s better for Christmas shopping than the Audubon Shop. It’s one of my not-to-be missed stops every year about this time. There are gifts for people of all ages from wonderful children’s toys to housewares, accessories, jewelry, garden items, bird feeders, binoculars, and all sorts of beautiful and intriguing items. Why settle for run of the mill when you can instead buy something lovely and unexpected? The book section is particularly rich with loads of books about animals, birds, nature, the landscape, etc. Many have a local or New England emphasis. You can also count on finding very nice boxed Christmas cards here. As part of my shopping at the Audubon shop I renew my parents’ Massachusetts Audubon Society membership. It comes with a subscription to their excellent magazine, Sanctuary, and all sorts of benefits including 10% off in the Audubon Shop. So skip the mall and head to the Audubon Shop this month. You’ll be able to make real headway on your shopping list and contribute to a great cause at the same time. The Audubon Shop at Drumlin Farm is located on Route 117 in Lincoln, MA. The address is 208 South Road, Lincoln, MA 01773. The store is open 10 am to 5 pm and is closed on Mondays except for Monday holidays. This entry was posted on Friday, November 29th, 2013 at 10:56 pm	and is filed under Living Here. You can follow any responses to this entry through the RSS 2.0 feed. You can leave a response, or trackback from your own site.